Until the arrival of the snowmobile, people in the Northern regions of the world, such as in Canada, depended on the use of sled-dogs to travel in snowy winter regions. Sled-dogs are hardy, intelligent and have developed a strong relationship with the humans who guided and trained them over centuries. Today a new interest in dogsledding has been sparked, that coincides with people’s fascination with northern regions as well as humanity’s love of dogs. In Ontario, there are a large variety of kennels and ranches where people can try dogsledding out, either by dipping their toes in with shorter one day or half-day tours, or by immersing themselves in week-long expeditions where they not only learn dogsledding skills but also traditional bush skills. Whether you’re seeking a different type of thrill or looking to learn the art of mushing, there is a dog-sledding experience out there for you in Northern or Southern Ontario. Here is a compiled list of some of the best dogsledding adventures you can give a whirl. Family-run North Ridge Ranch is located in Huntsville, Muskoka, Ontario. The North Ridge Ranch sled-dogs are Alaskan Huskies which have been bred especially for their athletic capabilities, adaptation to cold weather and their desire to run and pull humans. Their website features descriptions of each dog in their kennel, so you can learn more about the team that might be pulling you. Brad has spent the last 10 years building his kennel and his love for dog-sledding can be seen in his hardworking huskies. His partner Leah is also a dog-sled guide, and their daughter Brea is learning the art of mushing from her parents as well. They offer one hour and half-day tours. The half-day tours are 2.5 – 3 hours long, covering 20 km of Muskoka wilderness and they feature a stop where hot chocolate and granola bars are served. The one-hour tours are more suited to those with very small children, those seeking just a taste of dog-sledding or for those seeking a more affordable price while still getting the dog-sledding experience. 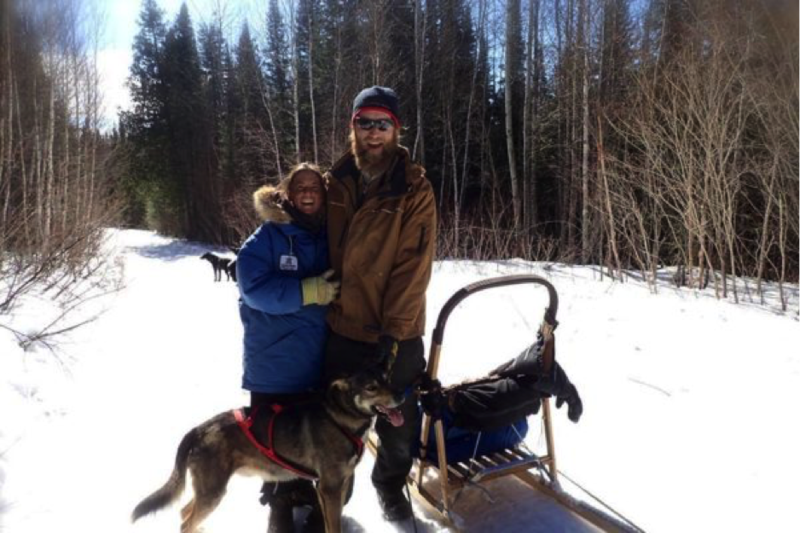 Winterdance Dogsled Tours are located in Haliburton, Ontario and is owned and run by husband and wife team Hank DeBruin and Tanya McCready-DeBruin. They run traditional purebred Siberian Huskies on a large piece of private property close to Algonquin Park. Their trails feature over 5000 acres of untouched wilderness that intertwine with seven lakes. They have a variety of guides who are all unique but have one thing in common: a passion for dog-sledding and wilderness recreation. 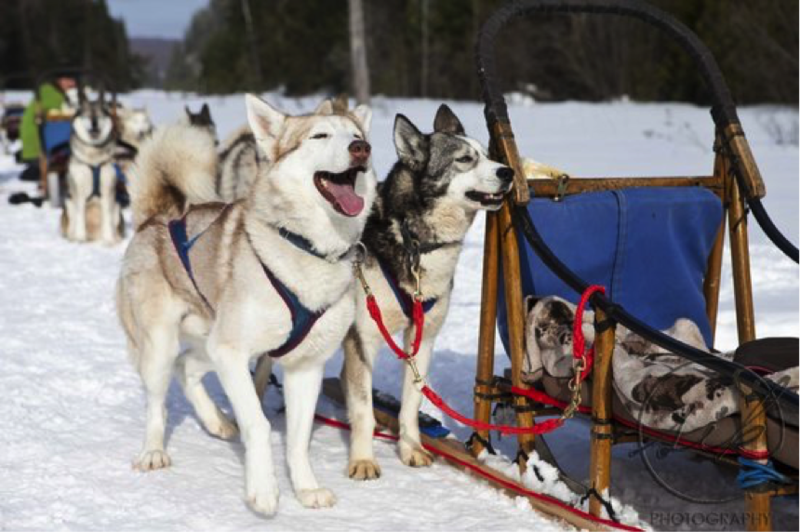 All dog sleds are 5-foot wooden basket style with cushions and cozy, fleece blankets to help keep passengers warm. Winterdance offers a variety of dogsled tours, such as the two-hour, half-day, full-day, moonlit run and multi-day tours. Winterdance Dogsled Tours. Photograph by TheCuriousCreature. 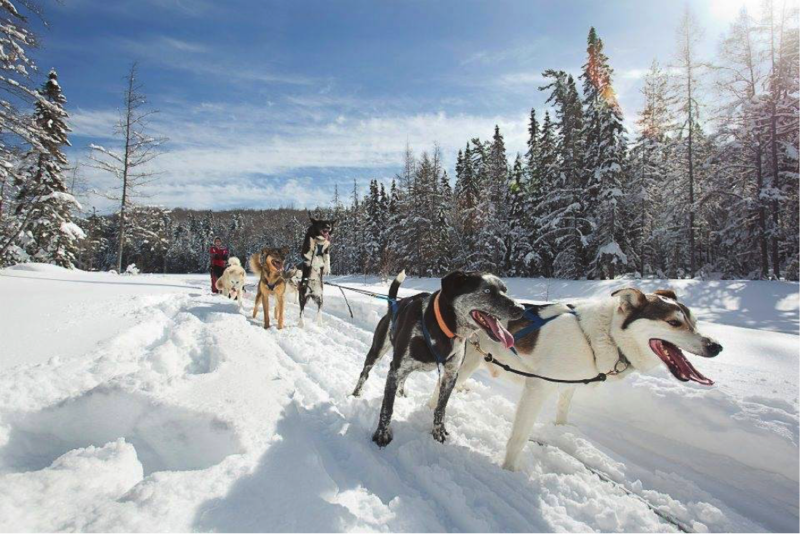 Wilderness Adventures offers 1 to 7-day dog-sledding adventure trips, led by qualified guides with over 40 years of experience in Algonquin Park, Ontario. You will be driving your dog-sled team through wildlife areas that will reach one of seven remote winter camps, where a hot meal and heated tent waits for you. You can enjoy a night under the stars and spend time with your guides by a campfire, and even snowshoe in the wilderness around you in the evening. This program teaches you the skills necessary to handle a dog-sled team. Chocpaw is located in South River, ON, and can be accessed by public transit via the Ontario Northland bus service. Chocpaw is a large provider of dog sled tours in Canada, with 225 dogs and 9 full-time guides. Their dogs are Alaskan sled dogs, a crossbreed that have been bred for strength, stamina, endurance, speed and a friendly temperament. Chocpaw’s staff have undergone a rigorous training and apprenticeship program to ensure they have the skills, knowledge and experience to provide successful runs. All expeditions come with provided food, such as soup, sandwiches and even desserts. They offer a large variety of tours, from one-day introductory tours to multi-night expeditions. Their specialty is a 2-6 day long expedition. Clients have the opportunity to sleep in 1 of 7 pre-set base camps, which feature cozy wood-oven stoves. Chocpaw’s dogs are known for being extremely friendly, and dog snuggles are encouraged! Snow Forest Adventures offer unique multi-day adventure trips in Algonquin and Temagami areas. Their dog-sledding adventures are special because they have up to week-long overnight trips where new mushers can learn new dog-sledding and traditional bush skills. In the Algonquin Park Dog Sledding trip, you will be taught everything you need to know about dog-sledding and staying warm in the Canadian winter. The 3-day, 2-night trip is the most popular. In the more extensive Algonquin Explorer Dog Sledding Expedition, travel by dog team and enjoy sleeping in a Cree expedition tent that is heated by portable stove. In this 5 days and 4-night expedition, you will learn more traditional and survival skills than in the shorter trips. For both trips, winter gear such as Sorel glacier boots, a winter parka, Thermarest pad and -30 sleeping bags are available for rent at reasonable prices. The rentals include a large duffel bag to pack your gear into at no extra cost. Included in the costs are park permits, accommodations, meals, snacks and beverages for the duration of the trips. You won’t want to leave after spending a week with the Alaskan Huskies and sleeping under the winter stars in your heated tents. Ravens Adventures Dogsled Tours offer 1 hour, 2 hour and 3 hour tours at an affordable price. Custom overnight trips are also available. Ravens Adventures also has a night tour where you can enjoy dog-sledding by headlamp and moonlight. They are located in Cochrane, Ontario with a variety of husky mixes, Alaskan huskies, Siberian huskies and Border Collies running their sleds. The hosts of Ravens Adventures are Brent and Gail. Boreal Journeys is a small kennel in Northwestern Ontario, near Thunder Bay, that offers a more intimate and customized experience. They strive to combine community, culture and natural history with visitors to provide a rare context to the dog-sledding experience. There are a multitude of dog-sledding programs at Boreal Journeys, such as the 5 Day Mushing Immersion where you learn kennel skills, that culminate in an overnight camping trip. They also have a 2 Day Boreal Overnight camping trip in the back country of North Western Ontario. They have a full day journey, a half-day sampler, custom half-days, moonlit runs, and family rides. 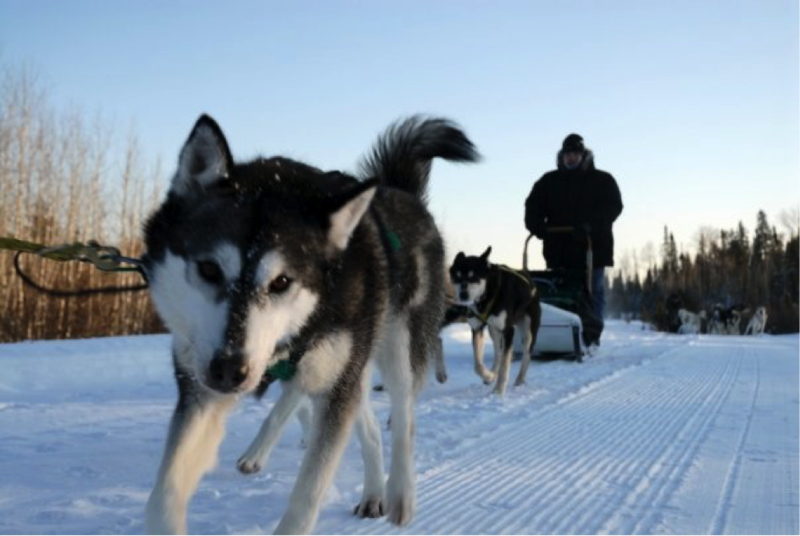 They also feature a unique Fall Training Tour where you can catch a peek at the secret world of sled dog training, practicing using a wheeled cart. Boreal Journeys also features a Leadership Development Training Program and Team Building Programs for groups where you can learn from working with dog team dynamics! Boreal Journeys has a dog-sledding program for everyone. Your hosts are Paul and Andrena, who provide a menu that features food from the local markets and farms, and a cozy breakfast and bed style lodging with a wood-stove and a sauna. On the camping trips, accommodation is a heated tent to ensure a good night’s sleep after a long trail.